HOPE – The Hope Public School District Board dealt with a full plate of back to school matters Monday night and got some good news about the planned expansion of parking space at Clinton Primary School. 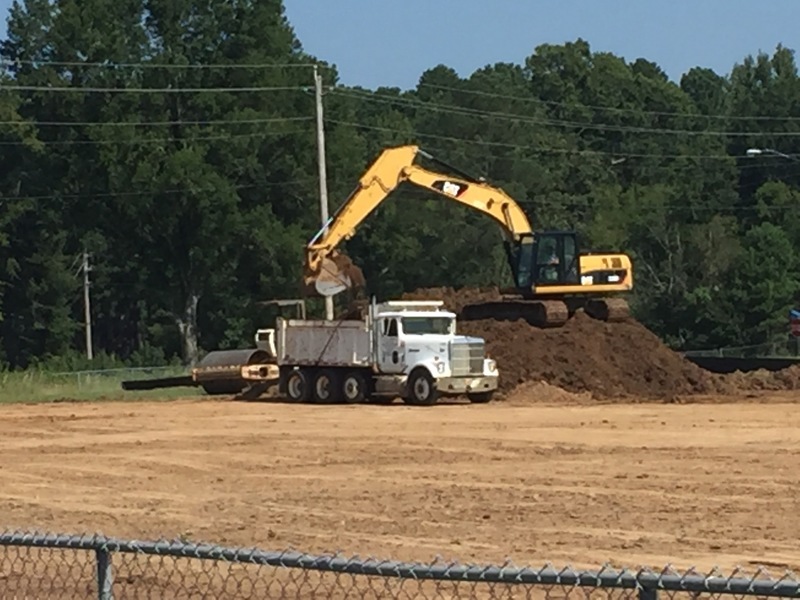 HPS Superintendent Bobby Hart reported to the board that construction had begun on the project after delays fostered by intermittent rains and the opening of classes on Aug. 13. Zone 8 Representative David “Bubba” Powers expressed some concern about the proposed completion date for the project because of rain delays, but Hart said the contractor appeared confident of meeting the 90 working day deadline. Contech Contractors, Inc., of Texarkana, won the contract with a low bid of $250,630, including curb and gutter work, less deductible alternative one of $17,156. The bid includes a price of $25 per cubic yard of undercut preparation work. The project will add approximately 200 new parking spaces on the northwest side of the existing building abutting a planned sidewalk adjacent to current parking. Ingress and egress will be through three entrance/exits from Lakeshore Drive, which will create six rows of parking spaces in three sections. Parking at the CPS campus has been a problem during events such as Open House and Parent/Teacher Conference Night. The board also agreed to a buy-back of sorts regarding a box truck which was originally purchased for the district nutrition services department through a federal grant. Hart said the federal funding purchase precluded a simple transfer of useful ownership to the district. Powers was concerned that the district had to “buy back” its truck, but Hart said the fair value of the truck, originally purchased for about $34,000, is now about $25,000. He said the vehicle has given more than 50,000 miles of service. Hart said the district plans to use the truck to transport equipment for extracurricular activities such as band and athletics. Also Monday night, the board approved agreements which will allow the district to provide services through its Alternative Learning Environment program to a consortium of area school districts including, Nevada Public Schools, Lafayette County Public Schools, and Blevins Public Schools. Hart said the district has typically provided such services as the host district for the consortium. The board also approved a continuity of operations agreement with the Lafayette County district which allows it to utilize HPSD facilities in the event that an emergency or disaster makes LCPS administrative offices unusable. Hart said the agreement is a standard practice, and the HPSD has such an agreement with the Southwest Arkansas Educational Cooperative here. --Purchased computer software for a special education assessment with some $3,000 in federal funds. --Approved a revision of the district’s parent and family involvement policy incorporating changes in language. --Approved district participation in a trauma infused campus conference. --Agreed to allow the Hope Kiwanis Club to use the Hope High School cafeteria for its annual pancake supper.